CORVALLIS, Oregon, November 22, 2010 (ENS) – Deep in the Earth’s oceanic crust, scientists have found bacteria that can eat hydrocarbons and natural gas, and have the genetic potential to store carbon. Increasing levels of carbon dioxide, a greenhouse gas when in the atmosphere, also raise the levels of carbon dioxide in the oceans, making sea water too acidic to support healthy reefs. Now, the findings by researchers from Oregon State University reveal a possible role for the deep ocean crust in carbon dioxide storage and fixation by pumping carbon dioxide into deep subsea layers where it might be sequestered permanently. Microbial processes in this expansive subseafloor environment “have the potential to significantly influence the biogeochemistry of the ocean and the atmosphere,” the researchers wrote in their report. Oceanic crust covers about 70 percent of the Earth’s surface and its geology has been explored, but practically nothing is known about its biology. Exploration is difficult and expensive, and most researchers had assumed little was happening under such extreme conditions of pressure and temperatures near the boiling point of water. 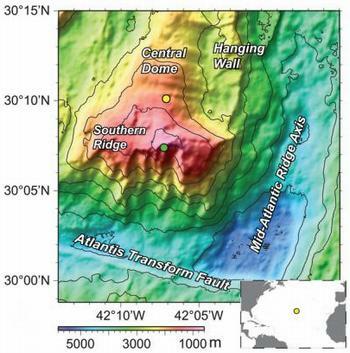 But at a site in the Atlantic Ocean near an undersea mountain, the Atlantis Massif, scientists from Oregon State University drilled more than 4,600 feet into rock that was both very deep and very old, and found a wide range of biological activity. Microbes were degrading hydrocarbons, some appeared to be capable of oxidizing methane, and there were genes active in the process of fixing, or converting from a gas, both nitrogen and carbon. The temperature of the sediments and rock increases with depth, and scientists now believe that the upper temperature at which life can exist is around 250 degrees. The ocean floor is generally composed of three levels – a shallow layer of sediment; basalt formed from solidified magma; and an even deeper level of basalt that cooled more slowly and is called the gabbro layer, which forms the majority of ocean crust. The gabbro layer begins under a two mile thick layer of crust. But on the Atlantis Massif, core samples were obtained from gabbro rock formations that were closer to the surface than usual because they had been uplifted and exposed by faulting. This allowed the researchers to investigate for the first time the microbiology of these rocks. The researchers also noted that methane found on Mars could be derived from geological sources, and concluded that subsurface environments on Mars where methane is produced could support bacteria like those found in this study. The research was supported by the National Science Foundation, U.S. Department of Energy, Gordon and Betty Moore Foundation, and the Integrated Ocean Drilling Program. Collaborators were from OSU, the Lawrence Berkeley National Laboratory, Tohoku University in Japan, Universitat Bremen in Germany, University of Oklahoma, and National Institute of Advanced Industrial Science and Technology in Japan.